Crisp, Oliver D. and Fred Sanders. 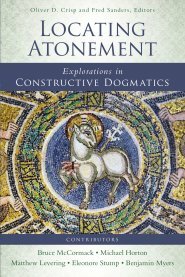 Locating Atonement: Explorations in Constructive Dogmatics. Grand Rapids, MI: Zondervan, 2015, pp. 256, $26.99, paperback. Locating Atonement is an edited volume drawing together several highly respected theologians and philosophers for the sake of determining where a theory of atonement might conceptually intersect with other prominent theological topics (e.g. the Eucharist, an account of the ascension, or a doctrine of divine wrath). The editors, Oliver Crisp (Fuller Theological Seminary) and Fred Sanders (Biola University), are both accomplished systematic theologians in their own right and conversant with the movement of analytic theology represented by several of the articles contained in this volume. In what follows, I will focus on the contributions of Benjamin Myers (Charles Sturt University) and Eleonore Stump (Saint Louis University), whose articles represent well the scholarly rigor of the volume as a whole. In “The Patristic Atonement Model,” Myers attempts to develop a model of the atonement, which expounds the views of the patristics and serves as an alternative to the Christus Victor model advanced by Gustaf Aulén. Myers offers this alternative to Aulén’s model because the latter model has recently come under criticism by several scholars who claim that Aulén has not really offered a model, but rather, a mere restatement of the doctrine of atonement. Models of atonement, Aulén’s critics claim, ought to explain atonement. And as a result, the success of Myers’s alternative model depends on its ability to illuminate the mechanism by which atonement is achieved. That is, it depends on how well the model he advances explains the mechanics of atonement. As Myers presents the patristic model, there are four metaphysical theses (p. 73) which the fathers endorsed: (i) realism concerning human nature, (ii) a construal of death as a privation of being, (iii) assent to divine impassibility, and (iv) the claim that the mechanics of the hypostatic union are unknowable. The mechanism by which atonement is achieved is then identified as the pouring out of divine life into the universal human nature such that “the privation is filled, i.e., cancelled out” (p. 73). Although there is much more by way of nuance to Myers’s account of the patristic model, the metaphysical theses and mechanism above provide enough for brief comment. First, it is worth noting that the appeal to mystery concerning the hypostatic union presents a considerable obstacle for the success of this model, for surely some understanding of the relationship between the divine and human natures of Christ is necessary for understanding how Christ’s divine life might be communicated to all humanity through the medium of an abstract universal human nature. Moreover, depending on the details of the participation relation, which holds between each particular human and the universal Humanity, this model may succumb to the same shortcoming as Aulén’s model; namely, that the putative model merely re-describes, rather than illuminates, how atonement was achieved. Second, the mechanism itself remains fairly enigmatic. Myers does offer an analogy to help us understand the mechanism: as light dispels darkness so does the immutable divine life dispel death (pp. 79-80). However, more needs to be said concerning the relations between light and darkness and how this example is supposed to clarify the defeat of death. Myers also describes the atoning action of Christ as involving a pouring out of divine life to fill the privation of being that is death, but this, as far as I can tell, is merely a restatement of the atonement using spatial terms to describe a non-spatial reality. As a result, Myers has, in my view, fallen short of his goal of offering a robust model of patristic thought on the atonement. However, if we view his contribution as programmatic, then insightful close readings of several historical texts and a penetrating analysis of Aulén’s original model make this article well-worth the read. Stump’s ecumenical “Atonement and Eucharist” details how the effects of the atonement might carry over into the practice of taking the Eucharist. To help us see this, Stump suggests that we consider the Eucharist as a replay of the story of the atonement. Stories or narratives, on her account, provide access to a sort of second-person knowledge, which enables a reader to develop a degree of closeness with the characters in the story. When a story involves historical events, a reader can then develop personal closeness with actual historical characters, and when the historical characters also exist in the present, a more meaningful personal closeness with that actual person becomes possible through the medium of the story. Stump’s account, then, is this: to take the Eucharist is to approach the story of Christ’s death, burial and resurrection anew, providing a chance for a deepened relationship with God each time the Eucharist is distributed. While it is fair to note that on Stump’s minimal account, any medium, which displays meaningfully a reenactment of the atonement story could in principle produce mutual closeness with God, no other medium was explicitly instituted by Jesus for this purpose. And at the very least, as Stump notes, any Christian tradition endorsing the real presence of Christ in the Eucharist will have reason to claim that no other medium could accomplish precisely what the Eucharist accomplishes, contrary to the above sentiment (p. 225). One minor point that ought to be addressed, I think, concerns the connection between the Eucharist and a doctrine of perseverance. Stump claims that receiving the Eucharist deepens the mutual closeness between a Christian and her God, with the effect that she will be more likely to persevere, that is, not give up on sanctification (p. 224). This much seems relatively uncontroversial. However, she goes on to claim that because two wills are always involved in the sanctification process, each Christian “retains the possibility of returning to her original resistance to God” (p. 219). While I agree with this point, I do not believe Stump has said enough to establish it. Two further worries should be addressed: (i) what kind of possibility does she intend to claim here (e.g. psychological, epistemic, metaphysical, etc.) and (ii) given that perseverance comes after justification (i.e. the point at which a Christian has given their consent to join God’s redemptive plan), why should we assume God’s interaction with our wills would remain unchanged under these new conditions? Alternatively, how does the interplay between God’s will and the Christian’s will change the permissibility, or possibility, of certain actions on God’s part which prior to justification would have counted as God impermissibly violating the will of the Christian? Clarifying these two things would further tighten an already excellent and thoughtful piece. As a brief perusal of the literature on atonement would indicate, theories of atonement have come under increasingly critical scrutiny. The contributors of Locating Atonement have taken this scrutiny seriously both by responding to objections and broadening the conceptual territory with which one must grapple in order to more firmly grasp the nature and implications of the atonement. As a result, students seeking both sympathetic and dissenting voices concerning a range of atonement views will leave satisfied, and the works therein will ably direct students concerning the most important contributions to the atonement, both those historical and those soon to come.